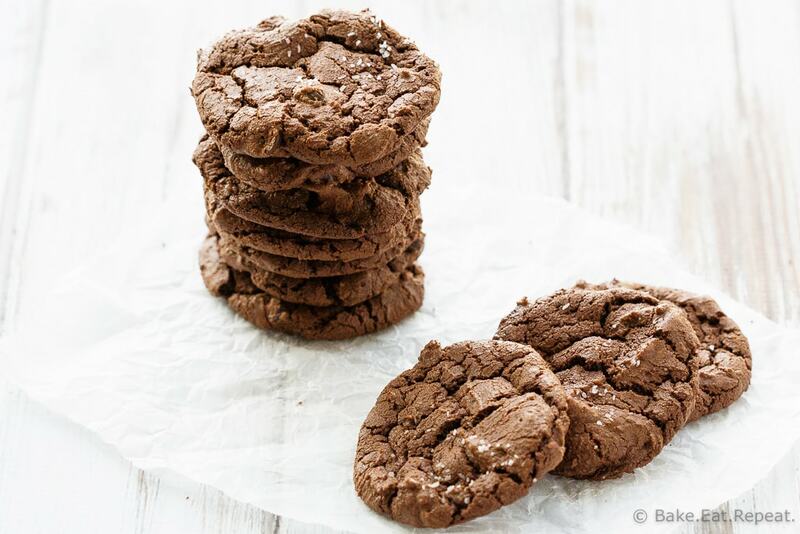 Salted Double Chocolate Cookies - Bake.Eat.Repeat. 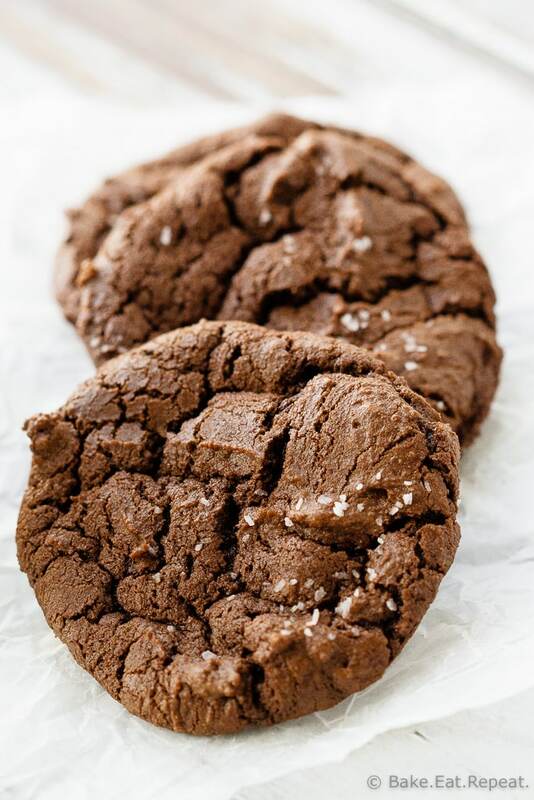 Chewy, brownie-like double chocolate cookies with a sprinkle of salt. 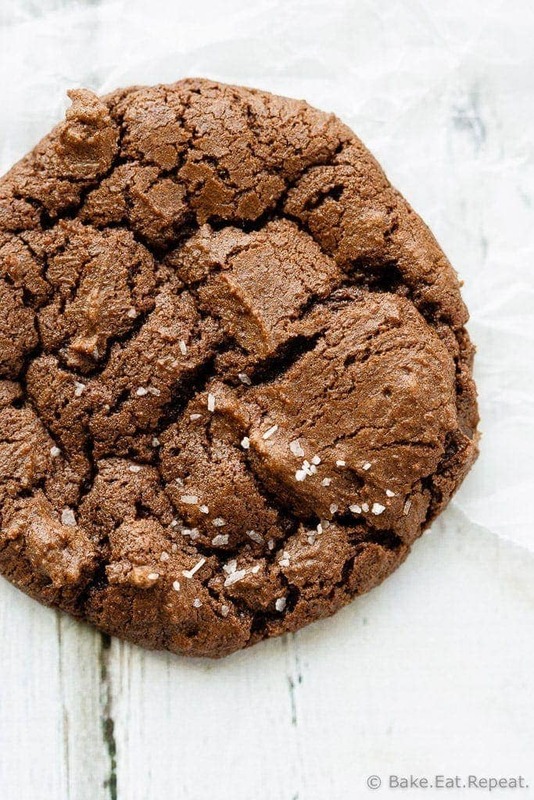 Because adding salt to a sweet chocolate cookie is the best thing you can do to it! Well it’s been over a month since I posted a cookie recipe, so obviously these salted double chocolate cookies needed to make an appearance as soon as possible. Clearly we couldn’t go much longer without a cookie recipe to tempt us all. No one can go without cookies for that long, right? Right. Not that we have been. Going without cookies that is. Just nothing new and exciting to share – I certainly haven’t gone a month without making cookies. We make them fairly regularly around here – but I’m perfectly okay with making the old favourites over and over again rather then trying something new. Which is actually what this recipe is – just updated because these cookies deserved some better pictures. They’re too good to be relegated to the horrible picture pile. Nobody wants to make a cookie that looks terrible. So I needed change that. As a bonus, that meant I got to make these salted double chocolate cookies again. And then try not to eat all of them immediately. It’s actually kind of an issue. Salt and chocolate is maybe the most addictive combo there is. It is really hard to stop after just one cookie. Although, does anyone actually ever eat just one cookie? Inquiring minds want to know. Clearly you shouldn’t eat any more then one at a time, but does anyone actually do that? I’ve always felt that cookies need to be consumed in pairs. Just me? I mean, I always eat just one. Obviously. That’s the healthy and mature thing to do. It’d be easier to just not make cookies. But where’s the fun in that? Double chocolate cookies with salted tops. Because the only thing that can make a chewy, brownie-like double chocolate cookie better is sprinkling some flaky salt on top of it. And then eating just one. In a microwave safe bowl or large measuring cup, put the chopped chocolate and the butter, and microwave at 50% power for 30 second increments. Stir after each 30 seconds, making sure to only microwave until just melted. If overheated the chocolate will seize and be unusable. It takes 1 1/2 to 2 minutes in my microwave, but keep in mind that all microwaves are a bit different! In another bowl, whisk together the flour, cocoa powder, baking soda and salt until well combined. In a large bowl or the bowl of an electric mixer, mix the chocolate mixture with the sugar, brown sugar, eggs and vanilla until combined. Add the dry ingredients slowly, mixing after each addition. Mix in the dark chocolate chunks. Line two baking sheets with parchment, or grease lightly, and drop the cookie dough onto the sheets by the tablespoonful, spacing 1-2 inches apart. Sprinkle the tops with kosher or flaked sea salt. Bake for 13-14 minutes until they have flattened a bit and have some cracks on the surface. Allow to cool on the cookie sheets for 4-5 minutes before moving to a wire rack to cool completely. This is cookie dough is very soft, more like brownie batter then cookie dough. Using a cookie scoop or two spoons, they are made as a drop cookie, and will bake just fine without chilling the dough. Adapted from Mel's Kitchen Cafe . Probably one of the most insanely perfect cookies I have ever seen in my life :D Thanks for sharing such a great recipe. May God bless you. The sweet and salty combo is the best! I love a sprinkling of salt on my chocolate cookies! Salted chocolate is my thing, so I'm loving these cookies! They wouldn't last long around me -- they look completely addicting and delicious! Chocolate cookies get me every time! These look so good, Stacey! I wish I could reach right through my screen and grab the entire stack! A sprinkle of sea salt makes everything better! I could totally devour one of these super chocolatey, delicious looking cookies. These cookies look SO perfectly fudgy and chewy! I love sweet and salty desserts! These cookies are stunners! I love the salt :) Pinning! Oh gosh I so agree! If I put a sprinkle of salt on cookies with chocolate I am soo in trouble ... trouble of eating them all! haha :) These cookies sound amazing!